Last Updated: 2 years ago in How do I? How To Integarete The MissDial With An Zapier . 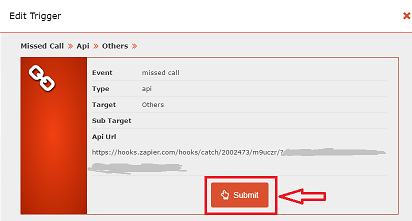 Below are the certain steps that will guide you how to integrate an MissDial with an zapier in few steps only. 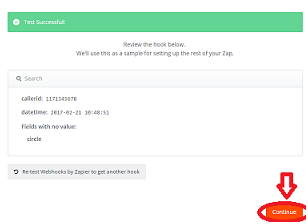 Step 1: First go to www.zapier.com and click on Make A Zap button. 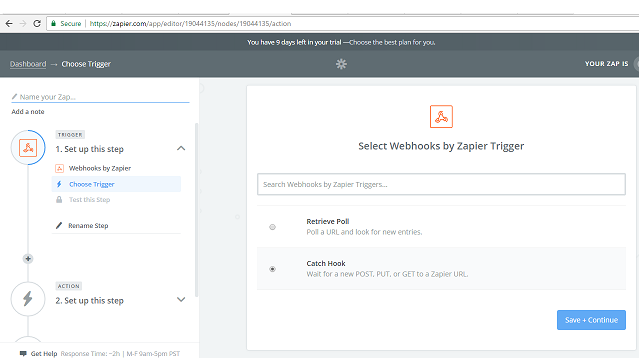 Step 2 : After clicking on a make a zap button then a new page will open where we have to choose a trigger app as webhook by zapier. Step 3 : After setting the trigger app then you have to check the radio button of Catch Hook and after that click on a continue button. 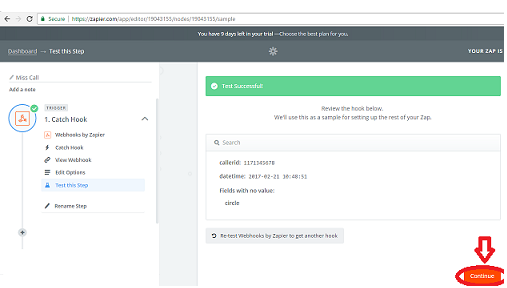 Step 4 : Next we have to set up a webhook , by clicking on copy to clipboard button we have to copy a custom url after that click on continue button .Note that After this an edit option will occur you can skip that option by click on continue button. 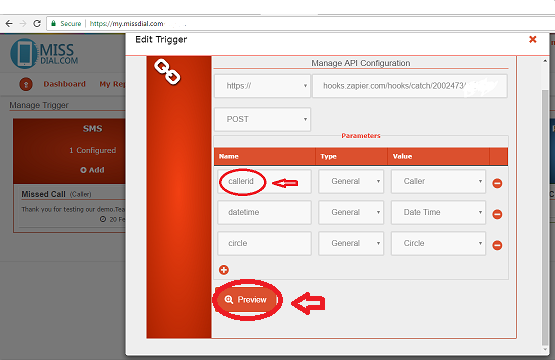 Step 5 : Next move to www.my.missdial.com where you have to open the trigger tab in that you have to edit the trigger in Manage api configuration then paste the Catch hook which u have copied and set an parameters which u needed, Note : (CallerId is mandetory to set .) at last click on preview button to see the final api and then click on submit button. 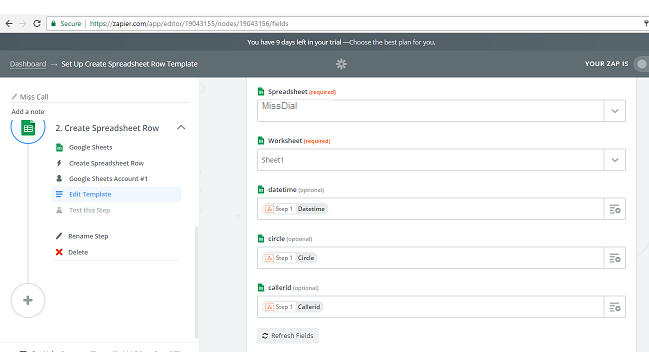 Step 6: After this move on to Test this step where you have an option to view your spread sheet row that it is selected or not , after viewing an successful test you can click on finish button. 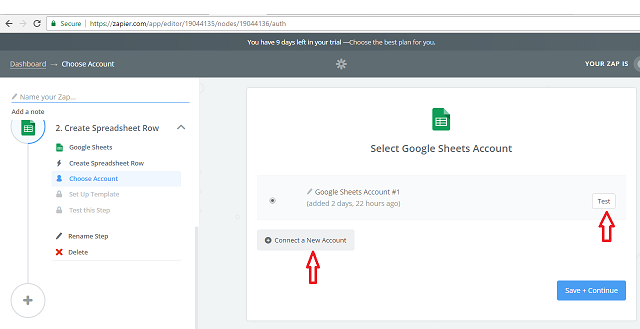 Step 7: Next we have to set an action to check our trigger of MissDial is working , you can select any action I have selected a google sheet to test our trigger , after selecting google sheet you have an two option create a new account and test if u have allow gmail to access google sheet then select test tab and check your sheet which u have created Note : you have to set an header of an sheet named as a parameter which you have selected in a missdial panel . 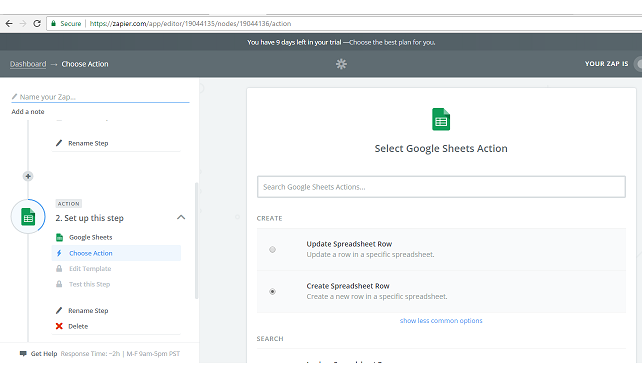 Step 8: Next you have to set a template in this an list of items , in spreadsheet dropdown select your sheet whatever the name you have given to your sheet for example (MissDial) next select a worksheet as sheet1 then select others as same. 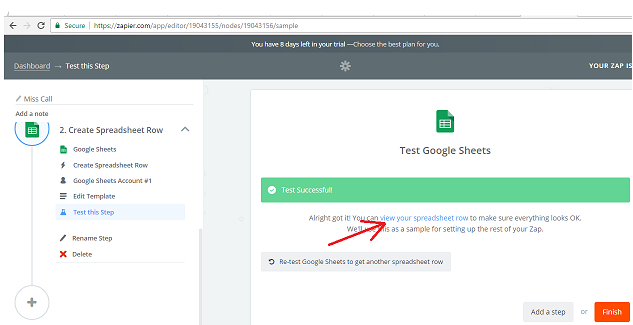 Step 9: After this move to the next step which is test this step in this you have to do a misscall to a number which is provided by Missdial team and then you can check your test status . Step 10: At last you can check your spreadsheet which has updated the data to the spreadsheet as you can see we have selected the Caller Id,Circle and Date time in parameters all these parameters are updated in a sheet .